The typical soapbox comes with strings attached: an agenda to be pushed, an ego to be stroked, a donation box to be filled. This book, on the other hand, attempts to fulfill the soapbox’s original ideal, as a fount of goodwill and ideas. Aaron Garrison, author of Learn Yourself: A Manual for the Mind and Synchronicity: One Man’s Experience, has taken the soapbox, and the speech has begun. In these collected essays, Garrison explores the ideological, the sociological, and the philosophical, with a healthy spoonful of psychology for good measure. 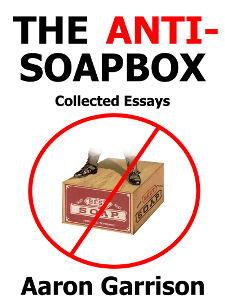 Written from the laymen’s no-nonsense perspective, The Anti-Soapbox takes a practical, real-world approach to some big issues, yet does so with a gentle touch, refraining from the bruising tone characteristic of soapbox oratory. So step right up, folks! On the anti-soapbox, there’s no shouting, accusation, or ecstatic gestures, just a good old-fashioned reality check.